4D Developments arrived on Friday, 28th October to commence the building of the new hall. We as a congregation are very excited and delighted that the time has arrived and we can see the fruits of our fund raising over these past 5 years. This would not have been possible but for the prayers and full support of the congregation, church organisations and our supporting neighbours and friends over this time. Please pray for the employees of 4D Developments for safe working conditions and pray that our Heavenly Father will guide and direct us in every step of the way. The Service and Dedication took place on Saturday, 30th September @ 2pm in the church and then we will headed over to the new Church Hall when the Rt Rev Dr Noble McNeely officially opened the New Hall and everyone had a chance to have a look around with tea served in the adjoining Church Hall. The family service to ok placeon Sunday morning at the usual time of 11.30am and the evening service at 7pm took the form of a Praise Service with special music. As with all projects, it is the people behind the scenes taking decisions, making choices and availing of their time to see this mammoth task finished and we as a congregation appreciate and thank those (no names but they know who they are) for their gifts, talents and 100% dedication and to see the end result is the 'Icing on the cake'. Blessed be the Lord our God who provides and sustains all our needs according to His plan. Please pray that the new hall along with our current hall will provide the Christian Fellowship, Leadership, Worship and Praise that will glorify God in the days, weeks, months and years ahead. This year's 2017 Christmas Fair was held on Saturday, 25th November with the new time from 10am - 4pm. The snow had arrived and for a while there was a flurry to clear paths etc. A variety of Craft Stalls, including a Cake Stall, Pre Loved Stall and GB Stall was provided by church members. Crafts and Face Painting for the children was available. Morning Tea/Coffee was served in the the Howie Sports Hall along with lunch of soup etc. Santa's Grotto was situated in the McWilliam Room. We thank everyone for attending the Christmas Fair, braving the bad weather to support our event. Even though the weather was bleak we were still able to raise around a £1,000.00 for the Building Fund. Many thanks to all who helped in anyway with the Fair, we appreciate the help and support from members of the congregation also the support of Family, Friends, Neighbours and the Local Community. 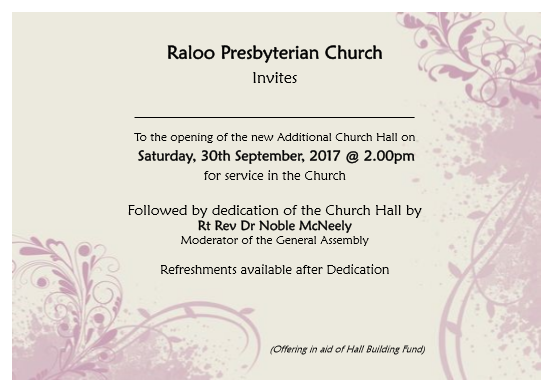 Here at Raloo we enjoy a flourishing congregation encompassing a broad range of organisations including BB, GB, Youth Club, Sunday School, Youth Fellowship, PW Group, Ladies Circle, Mums & Tots, Bowling Club, Thursday Club & Ramblers Walking Club (in the Summer Time). The Church Hall is in use every night of the week and as such we have outgrown our existing halls and so are working hard to fund raise and extend our current halls. We are just over halfway towards our estimated target of £400,000 due to the tremendous support of members of our congregation, faithful friends and family and also the wider community. The contract with 4D Developments has now been signed and work on the new halls should begin on Monday, 24th October DV. On Saturday, 15th October an Antiques Fair was held in the Church Hall from 10am until 4pm. An Antiques Club came along bright and early on Saturday morning and set up all their lovely items. The gentlemen set the hall up with tables etc and the ladies of the church provided scones, tray bakes and a variety of soups. The weather wasn't great but it did not dampen the atmosphere in the church hall and a total of just over £1,000 was raised for the Building Fund. ​Raloo's Church Auction was a great success. It was held on Saturday, 21st May and commenced at 1pm. The Auctioneer was Mr Stewart Watson from JA McClelland & Sons. C R Supplies - Gleno, F P McCann Ltd - Loughsire Quarry - Larne, Jackson's Butchers - Ballynure, Ross Park Hotel - Kells, R & K Blair - Straid, Robinson Quarry Masters Ltd - Glenwherry, Ballylagan Organic Farm - Straid, Clare Veterinary Group, Co-Op - Ballynure, Tweed Fuels - Islandmagee, Glenarm Castle Estates, The Fatted Calf - Glenarm Castle, Trouw Nutrition - Belfast, Gleno Veterinary Centre & Celtic Sea Minerals - Cork. We were very blessed on the day of the Auction, although the weather was not good in the morning time, it cleared up and half way through the Auction, we were able to go outside the hall and all the animals, feed supplements and miscellaneous items were sold. Tea, Coffee, biscuits and Hot Dogs were available at the hall hatch and the total raised reached £5,765.00. Many thanks to all who helped in anyway with the organizing of the event, those who provided items for the Auction, all the very generous donations that were given to us by local Companies and Businesses' - we could not have raised this amazing amount of money without everyone's help and support.